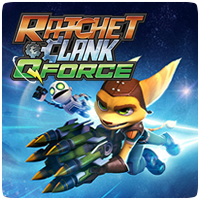 Ratchet & Clank: QForce is returning to the classic camera, weapons and third-person Ratchet gameplay that the series is known for, while adding a new base defense element that will have you building and defending a base against invasions using your ultimate Ratchet & Clank arsenal. The game will feature a Player vs. Player mode, and will support two to four players. Each match will be divided into phases. First, there’s a Recon phase where you’ll capture nodes in the battlefield. Then, in the Squad phase, you’ll build your base defenses and minion squads. Finally, it’s time to get nasty. In the Assault phase you’ll annihilate your opponent by attacking their base. The game ends when one side has destroyed all the generators in the opponent’s base.